I’m an atheist (yes you can be an atheist Fridgidarian!) and for the last couple of years I’m often accused of lacking faith. Once fully vested in the idea of it I can understand where this accusation comes from. My studies of epistemology since then have taught me how unreliable faith is as a reason to believe something. Which I often bring up in a discussion. Of course to a devout believer faith is everything. The very foundation of their belief. So the idea that I don’t see it as a reliable tool to build their foundation with I’m sure is very disconcerting. Here’s the rub though. I don’t see faith as a useless tool either. Let em explain. First, why is it a poor reason to believe? For the simple fact people can have faith in completely false things. Just having faith in something isn’t a very good foundation for belief. It’s too easily fooled. That’s not all though. The other place this becomes problematic is when you blame the person that doesn’t get the same results as you on their lack of faith. Watch out for the loop! It’s the leap of faith that leads to the loop of faith that creates a situation where a person can be forever convinced a falsehood is absolutely true. 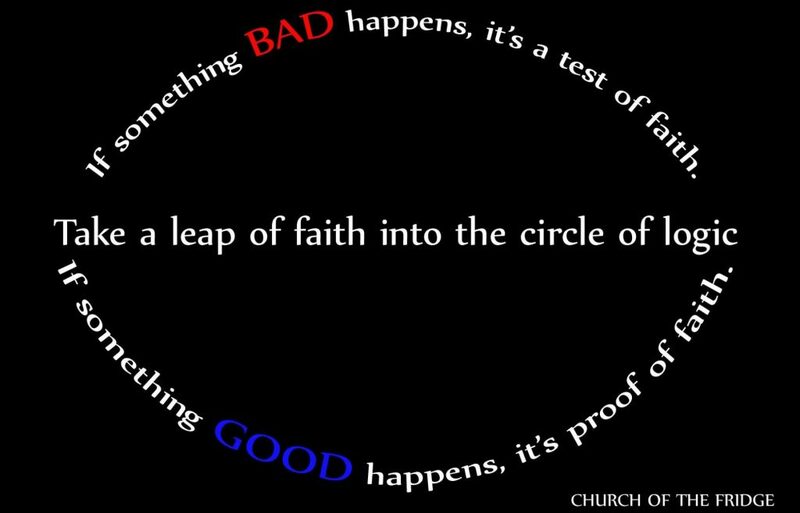 In case you didn’t pick up on the word play, a loop of faith is more commonly referred to as circular logic or circular reasoning. Say someone told you that the book Harry Potter is a true history and if you would read it and have enough faith you too would receive a spiritual witness that Harry Potter is true. If you take them to heart, read the book you will either have a spiritual impression or not. And that’s were religion takes advantage of you. If you get the specified result that of course proves Harry Potter is in fact a true book. If you don’t get the result, it’s not the books fault…you just didn’t have enough faith. This is an unfalsifiable claim. It can’t be proven wrong, and if you are interested in believing as few wrong things as possible its worth recognizing. The way out of this mess is pretty simple too. Just come up with a reasonable way to falsify the claim. If you can’t do so, might I suggest just believing it isn’t a particularly fruitful way to avoid mistakes either? After all I can claim there are purple space unicorns controlling your mind with invisible marshmallow lasers and you’d have a pretty hard time proving there isn’t. Now is the light dawning on why Hitchens shaves with a particular razor? I hope you now see that buying into a proposition ‘just because’ is not particularly useful either. That is if seeking truth is your goal. That pretty much eliminates what we might call blind faith. Which I’ve noticed that most people can see the problem with so I feel no need to delve any further in that direction. So where does that leave us? I think that rather depends on the definition of the word. I see it as basically hope in action. Case in point, right now in my lab I am conducting an experiment. I don’t know if it will work or not. But I hope it does and have enough faith in my particular insight to put it all together and give it a shot. Will my efforts be rewarded? Who knows. If it is, will it lead to products that will allow me to retire and write blog posts all day? Fridge only knows. But I will say this. If the experiment doesn’t work, I’m not gonna blame my lack of faith. The only think that can do is stop you from even trying. You might even say without it we wouldn’t take any risks. I’m not a huge fan of religion, particularly the organized kind that generate wealth for a few by entrapping their members in circular reasoning. But I can’t say every concept religions have come up with are all bad. In fact modern reasoning and scientific inquiry evolved from priests that really were looking for truth rather than pretending they already found it. So when in doubt? Go ahead and take that leap of faith… Just don’t let it run you in circles! While I can’t disagree with your argument about the circular logic of faith, atheism isn’t immune to your same argument. If you are atheist and yet admit we exist, how did we come to exist? I’m guessing you believe it is through true randomness? Maybe a multiverse generator pumping out random universes and it was an eventuality that we would exist or beings like us would exist? If that is the case, I don’t see how you could argue that mind controlling purple space unicorns don’t exist. In fact, I believe it would be a logical fallacy to argue they don’t exist. Maybe they don’t exist in our reality, but they should exist somewhere and sometime if randomness can give rise to our complex reality. Arguing that those purple unicorns don’t exist is faulty atheist based reasoning. As I see it, chaos times infinity would equally pretty much everything imaginable and unimaginable. Why wouldn’t it? The only valid argument I see for the lack of purple mind controlling unicorns is that there are fundamental laws that brought about the rise of a universe like ours. Universalistic laws to govern everything?… now that sounds a bit too theistic. What about the null position? What can’t someone say ‘I don’t know for sure how we came to exist… I mean I’m reasonably sure I came to exist because my mom and dad decided they’d like a kid. But I think you mean what started it all. Moving between null (I don’t know) and knowledge is a scale of certainty of belief. The reason it’s difficult to disprove purple space unicorns has been known to philosphy and science for a while. It’s called proving a negative. For what ever reason we find ourself in a universe where we know we exist and we realize we can’t know everything. Virtually ridiculous idea can be set up as proving a negative. So in climbing on the epistemology band wagon you are faced with a choice. Give credence to every idea phrased like that or not. Why believe something without a good reason? Seems obvious you just shouldn’t right? Unless, you are stuck. Do I have a good reason to believe I’m not just character in a a sims game on some alien school desk? No, not really. But I assume that’s not the case so I can move on. I believe that’s not the case, I have faith that’s not the case to move forward. Why believe something without good reason– totally agree, probably shouldn’t. But there’s the rub. What is a good reason? A belief that fits the scientific method? A belief that brings meaning to one’s life? A belief that helps proliferate the species? In the end, it seems to come down to faith about some belief that is subject to circular logic. Whether that is faith in a God, in universal foundational laws, or simply faith that purple unicorns or other crazy ideas don’t exist. Isn’t believing that it doesn’t exist unless it is proven that it does exist the same circular logic in action? How is that really any different than believing that it does exist unless it is proven it doesn’t? I just don’t see that much of a distinction between the circular logic arguments. Faith is believing a thing with reckless disregard to whether it is true or not. By definition, it can never be a virtue. Faith and trust are not the same thing. Trust is okay. Faith is NOT okay. It’s wrong and it’s bad. It’s a flaw, not a virtue. I think we only differ on definition, I defined it as a hope that leads to action… If I were to consider it as reckless disregard to truth, I’d be inclined to agree with you. But my reason for defining it the way I have is because in my experience people act in faith all the time. Often times just having faith in themselves to overcome stage fright for example. Faith is belief without proof, how do you get to reckless disregard and this idea that it can’t be a virtue? You say that is by ‘definition’ what definition are you referring too?